In recent times, Indian and in particular Bengali media (in the state of West Bengal, India) are unjustifiably generous when it comes to heaving accolades on the current generation of Bengali filmmakers. This surplus of praise is mostly indefensible as recent Bengali films are still imprisoned by their strange obsession with relationship centric dramas. Exploring relation-based dramas, however, is not the main problem. The problem lies in elsewhere. Most of these cinematic efforts can mostly be characterized by the following undesirable elements: characters that are outside the bounds of possibility, only scratching the surface of emotional layers without much regard for deep character analysis (a lesson in this regard would be to watch, for example, the highly acclaimed Iranian film A Separation by Asghar Farhadi), lack of sensible dialogues, strong desire to pose as an "intelligent" filmmaker who is up-to-date with the world cinema (read literally stealing from these films; an example would be the much-hyped Bengali film Autograph), choosing style over substance, underappreciation for aural instruments of a film (Ritwik Ghatak was a pioneer for using sound brilliantly), sometimes unconvincing and archaic plots (when plots are convincing they are marred by some of the other factors mentioned here), and sheer inability to build up narratives that do not satisfy two important criteria of narrative cinema: credibility and coherence. Although, these films are technically much superior than their 1990s and last decade counterparts. Bhooter Bhabishyat avoids just about all of the above pitfalls. The story is exceptionally imaginative and yet simple. A gang of eclectic ghosts (a cook, a Bengali music band member, a Zamindar aka landlord, a representative of the East India Company, a refugee from Bangladesh, a Bengali theatre actress, a revolutionary from 70s' Calcutta, a Rickshaw puller, and a few others) need help as they are about to be evicted from their current home as a businessman is all geared up to make way for malls and multiplexes.In the backdrop of this, an aspiring director steps in the same old mansion (where these ghosts are housed) for checking the site of an about-to-be-made film. What follows is a burst of activities replete with spoofs, puns, songs, and dance. Although, beneath all these lies a satirical message about the greed of the modern society that spreads its gluttonous wings at the expense of rich sculptural heritage of cities. The first time helmer Dutta is a master storyteller. Humorous and sharp dialogues (although being an ad filmmaker himself, Dutta couldn't escape the usual knack of an ad-maker for inserting punchlines after every two lines of dialogue), first-class camerawork, unforgiving editing, clever montage of sound pieces, keen eye for details, credible reproductions of a bygone age and society, idiosyncrasies of ghostly creatures - everything seem to jell for the film. Dutta heavily borrows from the master director Satyajit Ray's works and he is not at all reticent about this. In fact, when the aspiring filmmaker and the narrator of the ghosts' lives converse to build up the suspense, their performances strongly remind us of the interactions between the famous Bengali detective Feluda and his assistant Topshe. Delivery of some of the dialogues in the film that rhyme with each other is reminiscent of the lyrical exchanges from Heerak Rajar Deshe ( The Kingdom of Diamonds). In many other aspects, the film is replete with references from Ray's films. In fact, Dutta pays a grand tribute to Ray in this film. 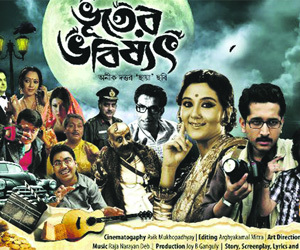 Overall, Bhooter Bhabishyat is a rare combination of ingenious plot idea, almost flawless execution, skillful exploitation of the medium as an art form, and an eye for commercial success - a combination that is visibly absent in most of the recent Bengali films.